Steven (Chicagoland, United States) on 12 December 2012 in Architecture and Portfolio. A close-up of Big Creek Bridge, a double-arched concrete bridge completed in 1937. Beautiful photo in that great B&W! Love it. What an achievement that elegant structure looks to be - just imagine being faced with the idea of it ! This is a fine closeup of the bridge you showed us yesterday, Steven. excellent frame and monochrome . super angle ! 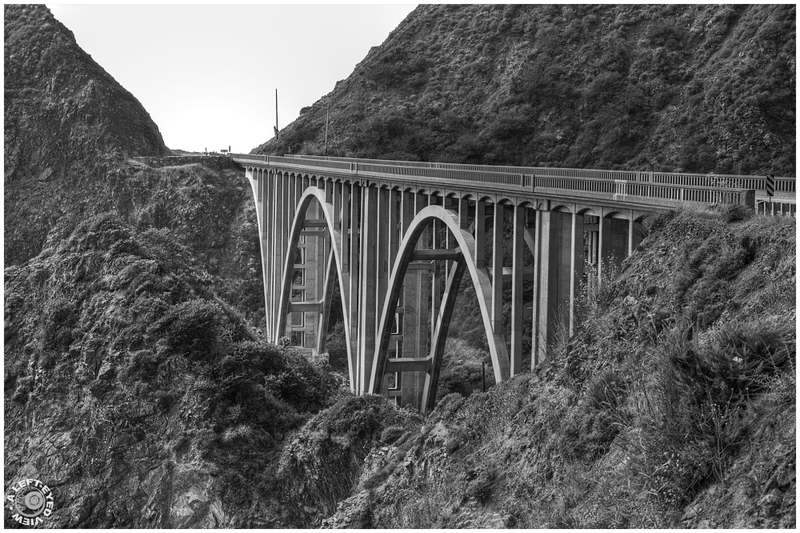 A fabulous perspective of this beautiful bridge and beautifully presented in monochrome. The clarity and detail is superb ! You selected a fine viewing angle and the image is wonderfully nuanced and detailed. Very impressiv ! And a superb photo ! An excellent POV that presents the bridge in an impacting way. The B&W rendering is wonderful. An amazing looking bridge nestled in the landscape; wonderful view and photo! That bridge is gorgeous. It is built perfectly in keeping with it surroundings. I am almost afraid to ask where you were when you took this shot. @Ruthiebear: There was a viewpoint that jutted outward toward the ocean where you could look "back" toward the bridge. Superbe B&W avec de belles nuances de gris! Très belle perspective et superbe N&B ! wonderful composition, clarity and detail! Wonderful monochrome and a great perspective. The bridge has such graceful lines. Beautiful! A very impressive bridge and you selected a wonderful point to photograoph. Cool bridge and nice shot of it. Excellent POV and b&w processing. remarkable structure! love the simple yet elegant and effective design !